Why Be Happy When You Could Be Normal? takes its title from the response Winterson’s adoptive mother made when she told her how happy she was in a relationship with another woman. Ah, Mrs Winterson, who has loomed large in the public perception of the author to the detriment of two and a half decades of interesting work. She only has herself to blame, perhaps, having begun her career with a semi-autobiographical novel, and having begun that novel with a depiction of her monstrous mother. (“Like most people, I lived for a long time with my mother and father. My father liked to watch the wrestling. My mother liked to wrestle. It didn’t matter what. She was in the white corner and that was that.”) For Oranges are not the only fruit to have become Winterson’s most famous book is not very surprising: it’s her most straightforward, her most plainly warm and witty and affecting. (The award-hogging TV adaptation didn’t hurt.) What came next in her fiction was always more ambitious, and to me more interesting, even when it felt inchoate or reiterative. Oranges is the book, twenty-six years old, which is still the only one namechecked on this cover; though that’s apt enough as it seems clear that this memoir is destined to become her second most famous. It’s apt too as Winterson expresses rueful regret at the way in which Oranges has been taken as her autobiography: so here’s the real thing. Oranges was a “cover version … a story I could live with. The other one was too painful. I could not survive it.” If Oranges was all about her mother, then Why Be Happy is all about her mothers: Mrs Winterson, who took her in (though “the Devil led us to the wrong crib” she would say when young Jeanette was troublesome), and her birth mother, who gave her up aged six weeks. (As I write this, my son aged four weeks is sleeping in front of me. This is heady stuff to contemplate.) She does it plainly, and winningly, part confessor friend, part eloquent persuader. Mrs Winterson dominates the first half of the book, as she dominated Jeanette’s life (I’m using her first name not to sound cosy but to prevent a blizzard of Wintersons from blocking up my sentences). She dominated, yes, because she was large: “she loomed up. She expanded. Only later, much later, too late, did I understand how small she was to herself.” The tone and intention is not mocking or disdainful. Jeanette wants to understand Mrs Winterson, with her contradictions, eccentricities (“two sets of false teeth, and a revolver in the duster drawer”) and infectious misery. To Mrs Winterson, the universe was a “cosmic dustbin”, and it seems to Jeanette that her religious attachment to an Old Testament God was a manifestation of her fear of happiness. “She thought that happy meant bad/wrong/sinful. Or plain stupid. Unhappy seemed to have virtue attached to it.” The battle between her and her mother, Jeanette says, was between happiness and unhappiness. Reading the book, and in particular the later sections which disclose her violence towards her girlfriends, failed relationships, breakdown and suicide attempt, one could hardly consider this devotee of happiness an untroubled soul. Then again it is not happiness she argues for, but the pursuit of it. The chase is the aim. Later, when I was successful, but accused of arrogance, I wanted to drag every journalist who misunderstood to this place, and make them see that for a woman, a working-class woman, to want to be a writer, to want to be a good writer, and to believe that you were good enough, that was not arrogance; that was politics. So when people say that poetry is a luxury, or an option, or for the educated middle classes, or that it shouldn’t be read at school because it is irrelevant, or any of the strange and stupid things that are said about poetry and its place in our lives, I suspect that the people doing the saying have had things pretty easy. A tough life needs a tough language – and that’s what poetry is. That’s what literature offers – a language powerful enough to say how it is. Social breakdown and the strength of society is important to Jeanette because she needed to get the sense of community that was lacking in the home from somewhere. “I never believed that my parents loved me.” (And suddenly it becomes clear why love is relentlessly presented as our highest value and achievement in her fiction.) “When love is unreliable and you are a child, you assume that it is the nature of love – its quality – to be unreliable.” The Bible helped, telling her that God loved her, but as she reached middle age, she found herself unable to resist seeking out her first mother, the one who gave her up. “Adoption drops you into the story after it has started. … The feeling that something is missing never, ever leaves you – and it can’t, and it shouldn’t, because something is missing.” The last third of the book is a gripping and powerfully affecting trail in search of her birth mother, and of what happens afterwards. It is typically honest and unsparing, and left me feeling emotionally exhausted. [My mother] didn’t like stories about being raised from the dead. She always said that if she died we weren’t to pray to bring her back. I did cry. Why is the measure of love loss? I wanted to read this book anyway – but even more so now I’ve read this review. 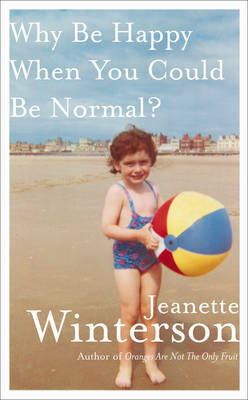 I’ve never read anything by Winterson, though she’s long been on my radar. I actually have a copy of Written on the Body that I’ve picked up intending to read a few times, but it’s never felt like the right time. Even though your review was for a different book, you’ve convinced me that it’s time that Ms Winterson and I get better acquainted in some form or another! Fabbie review as ever Mr. S.
Who is happy? Who is normal? The mention of the Bible was surprising. Once the ulimate canonical text, it is now so often vilified or ignored. I think the quote “There’s no such thing as autobiography, there’s only art and lies” is absolutely and profoundly true. memory is fiction. A recreation at best. Honest autobiography is an impossibility. Her argument that “the chase is the aim” as you put it is a very persuasive one. The US Declaration of Independence doesn’t promise happiness, but it does the right to pursue happiness. That makes sense (though I consider the Declaration of Independence a superbly drafted document I admit). It’s even questionable whether the state of happiness is desirable except as something we strive for. I’m getting into Brave New World territory there though. I think she’s right too about the “conspiracy of ignorance” regarding women writers. Does she address who she thinks is ignored? “It isn’t a hiding place. It’s a finding place.” Brilliant. This isn’t for me yet, despite how good it sounds and how good your review is. I haven’t read any of her novels yet. Since you’ve been through thick and thin though I’d be very interested to hear what you think falls into each category. Well broadly Max, I’d put into thick (or worth reading): Sexing the Cherry, Written on the Body, The Passion, Lighthousekeeping, The Stone Gods and (despite what I’ve said above) Oranges. And her essays, Art Objects. Into the thin, or best for converts only, I’d put Art & Lies, Gut Symmetries and The Powerbook. And her story collection The World and Other Places. I can only add to the consensus here: great review. Although I think Gut Symmetries (which has got a barmy Joan Bakewell quote on the jacket) is under-rated. Lee, I went off Joan Bakewell years ago when she did a Heart of the Matter about cryonics – the rather dodgy idea of freezing dying people in hope of resuscitating them in some future period when whatever’s killing them can be cured. It’s a dumb idea because on present tech ice crystals form in the brain cells during freezing, essentially exploding them and turning the brain into soup. Everyone frozen is simply dead without hope of return. I don’t deny the possibility that this tech may one day be viable, but today it’s fantasy and to make it viable would need some fairly fundamental breakthroughs that as best I know aren’t anywhere near in the offing. Joan Bakewell though. She took some kind of bizarre personal offence and was incredibly antagonistic to people who ultimately are merely foolish with their own money. I suspect the issue may have been a religious one for her, though I could be wrong, but she came across as fanatically opposed to a group who just didn’t merit any strong emotion at all. They were wrong, sure, but they were harmless. Barmy quotes from her wouldn’t surprise me. I understand that back in the day she was a major public intellectual, but like Jonathan Miller I was never persuaded she was actually particularly suited to that role. She’s clearly hatstand, Max, no doubt about it. A cranky crank. Your tale there is one of many that could be stacked up against her. I loved the book, read it in one sitting. Your review is spot on, you put my thoughts into words. Uhn huhn. This sounds like my kinda book. Jay, my favourite Winterson, as you’ve noted, is Sexing the Cherry. After Oranges, I’d head on chronologically, to The Passion and then Sexing the Cherry and Written on the Body. After those came her ‘tricky’ period, though I have a good deal of affection for Art & Lies. I’d give the next two – Gut Symmetries and The PowerBook – a miss unless you feel you must read everything. Lighthousekeeping, which came next, was better, and I really liked The Stone Gods. It’s her only work of obvious SF, but most of her books have fantastical or mythical elements, and I suppose part of Sexing the Cherry could be said to be SF-ish. As to Art Objects – I loved it! I must go back to it some time. I’ve read it a couple of times, but both shortly after it was published (in 1995), so I would be most interested to see how it holds up for me. this is great. thanks John. Just to let you know, I saved a link to your comment here with Winterson recommendations. It’s an incredibly handy resource for those of us just starting out with Winterson. Having now read Oranges, which was remarkably well written, I’ll check out The Passion next. Thanks. Thanks Max. I hope you continue to find her interesting.